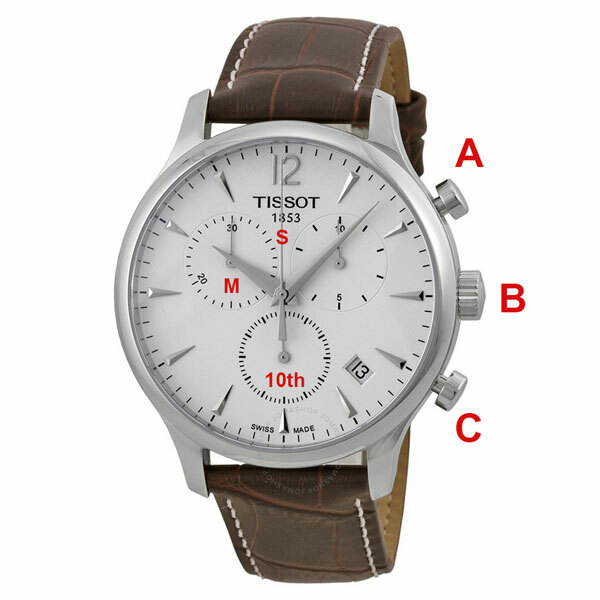 After using the stopwatch, you may need to calibrate your Quartz watch's chronograph functions, when the second hand does not reset back to zero. Below are some instructions that apply to most Quartz watches. Checking your manual is strongly advised. These instructions do not help with most Automatic watches. Typically, there are three buttons on the right side of the watch. We lettered them here from the top A, B and C. In this example we chose one version of a subdial set. There are also different versions of the subdial, but they can be set in the same way. Start by pulling the crown (B) out to position 2. Then press both buttons (A) and (C) simultaneously for at least 2 seconds. You should have now engaged the chronograph adjustment mode. Continue this until the second hand reaches the 12h marker at the top. Setting and confirming the adjustment is done by pressing the button (C). Press the button (A). The hand should move once. Continue this until the hand reaches the top. 4) Adjusting the Chrono Minute Hand (M). 5) Allowing the watch to perform the reset - Once completing these steps, Press the crown (B) back in. Your chronographs should now reset(spin). Keep in mind - (C) is also used to save the setting and to jump to the next subdial. Even if you have started adjusting the wrong chronograph, complete setting it and only then jump to correct or next one.